In last week’s post I asked you the following question: “Are you too busy to learn a foreign language?” Chances are, you’re actually not. The problem most likely lies with your priorities. We would all like to get more out of life, to feel fulfilled at the end of each day, and to get more done in less time. If you answered “yes” to any of these statements, then I encourage you to pay careful attention to the 10 following simple, actionable tips. Believe me, the truth is that you are probably less busy than you think, and you are, just like me, probably not making use of your time in the most efficient way; there is always room for improvement! 1) Write down and keep track of where your time is going. This is a really good exercise. It might seem tedious but it’s worth doing for just a few days. Simply write down in a notebook where your time is going every day. You have 24 hours. For each 15 or 30mn increment, precisely write down what you are doing (sleep, eating, shower, internet site, movie, email, etc.). After a week, take a good hard look at where your time is going, and see if there’s room for improvement. As stated in last week’s article, if you believe results from the American Time Use Survey, done by the Bureau of Labor Statistics, and other studies, plenty of Americans have faulty impressions of how they spend time in our “too-rushed-to-breathe” world. 2) What are your goals? What is it that you want to accomplish? What needs to be done? 3) Have organized plans of actions. 4) Make a list before you do anything. We always have a bunch of things to do at the start of a day. Make one list for the week, the Sunday or the Saturday before, and make one list for each day the evening before. Organize things in order of priority, and when you work on something, ask yourself: “Is this really my top priority task?” Reminding yourself of this will quickly develop good work/study and self-discipline habits. 5) Delegate/outsource whatever you can. This is something that interestingly few people consider. If you do not learn to delegate and outsource things that others can do for you at a lower price than you are “worth” (on an hourly basis), you cannot grow and become financially successful. Tim Ferris, in his bestselling book “The 4-Hour Workweek,” gives some really amazing tips (see Chapter 3) on how to outsource a wide array of things, from finding concert tickets to buying your kids gifts or reminding you by phone of commitments you have. Companies in India, for example, charge ridiculously low rates and can do practically anything for you. We have a tendency to always do what is urgent, rather than what is important. Important tasks are seldom urgent, and urgent tasks are seldom important. One way you can overcome procrastination is through a very simple tip: every morning when you wake up, repeat to yourself “Do It Now, Do It Now, Do It Now.” I swear this will help you to overcome procrastination, at least a good bit! For additional tips, check out my post on the subject. You need to concentrate if you want to be productive. If you start a task, put it down, then come back to it, studies have shown that the task will take as much as 500% more to complete than if you would’ve stayed with it until it’s finished. That’s quite a staggering loss of productivity. If you have something that needs to be done, just do it now and finish it entirely before starting anything else. Forget about “multitasking,” multitasking is a code word for attention deficiency. Your biggest enemy here is the internet and social media sites such as Facebook and Twitter, as well as emails. Use a program such as Leechblock, or any similar one, to block specific sites during set time periods so that you can focus on the task at hand. We do something because we expect some results, some consequences, some rewards. Get used to have some deadlines to your goals and to your to-do lists, and treat yourself to dinner, to the movies, or to whatever it is you enjoy when you have reached your goal. It can be something as small as having a box of candy on your desk and eating a couple of them each time you check off an item in your to-do list. Whatever it is, reward yourself when you complete something, it’s more important than you think. 9) Do important tasks early in the morning. In tip #4 just above, I highlighted the importance of making lists of things you need to do. This routine also means you will often end up doing the highest priority tasks in the morning. This is important, because as I stated in a previous post, when we are continually exerting self-control, our ability to resist temptation weakens. This suggests that if you have tasks that require self-control, it’s probably better to do them in the morning, rather than in the afternoon or evening. Early in the day is the time when you have the most motivation, so use this time wisely. That’s pretty much what last week’s article was all about: make use of dead time (also known as “transition time”) to your advantage to learn whatever it is you want to learn. Dead time includes when commuting to and from work or school, during break times, or when shopping. You can easily learn a language up to intermediate proficiency just by doing that. That’s it for today folks. I hope you’ve found these 10 tips useful, and if you did, you can thank me by sharing this article with people you care for! And if you’d like to get more advice on how to get things done and make the best out of the 24 hours you have each day, I highly recommend that you read “Getting Things Done” by David Allen. Do you think you could make better use of your time? 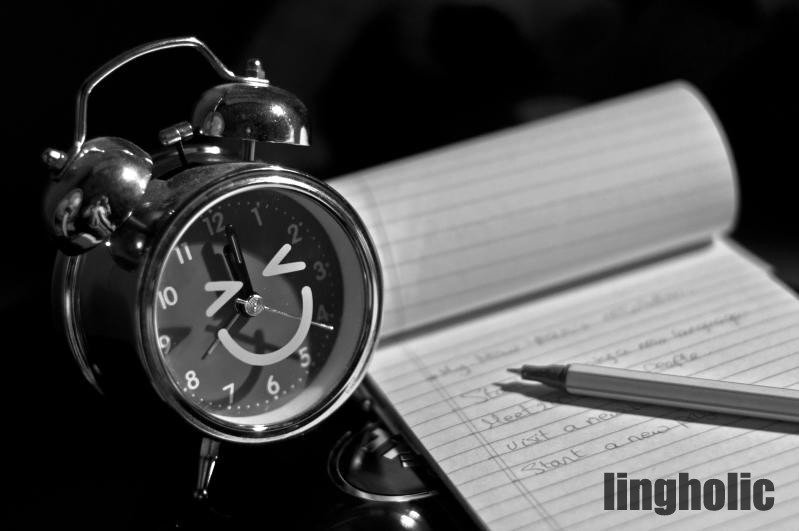 Are you really, honestly too busy to learn a language? Think about it, and reply below. Mais je suis totalement d’accord, je pense que la majorité des personnes n’ont pas de but précis (soit à court, moyen, ou long terme) ni de plan d’action, et je pense que c’est une des raisons majeures pourquoi la plupart des gens trouvent qu’ils n’ont pas le temps de faire ceci ou cela. Tu me diras comment l’organisation de ton temps ira et si tu vois des changements! Merci. C’est très gentil. Moi, je suis courant quand j’écrire quelque chose, mais quand je parle, je suis un peu moins bon. C’est drôle, mais il y a trois persones qui pense que je suis natif ici au Québec. Un autre me dit que je parle sans accent, mais juste des phrases général. I will let you know, how it is going with my organization! Hi Sam 🙂 And what about an opposite problem? I have so much time it makes impossible to manage it well. I spend a lot of my day on learning language but in passive way, because I know that “I still have much time….” for more serious things. I watch TV series, learn blogs and I’m concious I could use it in more effective way but I can’t. Excess of time is so hard to take use of like a lack of it 🙂 Well, I need to find new goals with some deadline. Take care! The point you’ve outlined is definitely important to consider and think about. In my opinion, when you have a lot of time in your hands it’s important to have some kinds of “projects” (such as learning a language, building a website, learning a particular subject, etc. ), coupled with a lot of social/networking activities. The busier you keep yourself, the more you’ll be able to develop a certain routine and manage your time well. Try to diversify what you do during your free time and take on new challenges. When I had more free time I used to take free university courses on coursera.org and I really enjoyed it. That was in addition to learning languages, nourishing my social life, and building a website. Hope this will help! By the way, which language(s) are you learning these days?